Sara Kendall studies the discursive forms and material practices of international law and global governance. She earned her interdisciplinary doctorate from the University of California at Berkeley, where she specialised in international law and human rights, jurisprudence and social thought, and political theory. Her doctoral work considered issues of jurisdiction at the Special Court for Sierra Leone, which was based upon a year of trial observation through Berkeley’s War Crimes Studies Center court monitoring project in Freetown. Prior to her appointment at Kent, she worked as a researcher in the Department of Public International Law at Leiden University, where she studied the effects of International Criminal Court interventions in Kenya and Uganda. She also taught postgraduate courses in international relations at the University of Amsterdam’s department of Political Science. In a past life she worked for an attorney specialising in police misconduct and prison litigation in Oakland, California. Sara’s research addresses legal responses to – and complicity with – forms of violence, from international crimes to the conditions of possibility of armed conflict. One strand of this research has focused on the ways in which legal forms seek to contain or respond to mass atrocity through international criminal law and international humanitarian law. Her current research project, ‘Legal Humanitarianism: the Restorative Turn in International Criminal Justice’, focuses on the emergence of a juridical category of victimhood in International Criminal Court practices. A second strand, ‘Humanitarian Complicity’, focuses on the role of humanitarian claims in justifying (state) violence, from the colonial period to the present. Sara has published on a range of topics that touch upon relations between violence and legal form. Her more recent work has taken up contemporary articulations of ‘juridified’ violence, such as the US practice of targeted killing, the ‘unwilling or unable’ doctrine and changing conceptions of territory, and a forthcoming piece on lethal autonomous weapons systems. Within the field of international criminal law, she has published on the implications of the victim as a legal category, what the field might learn from (critiques of) humanitarianism, the political economy of international criminal tribunals, tribunal legacies, and ‘hybridity’ and legal pluralism. Her co-edited volume, Contested Justice: The Politics and Practice of International Criminal Court Interventions (Cambridge University Press, December 2015) is available for download here. A third area of research and publications consider the mediated forms through which law is produced and reproduced, such as the rise of expert knowledge in post-Cold War constitution-drafting practices, and representations of transitional justice and impunity in films such as The Act of Killing and Lumumba: La Mort du Prophète. 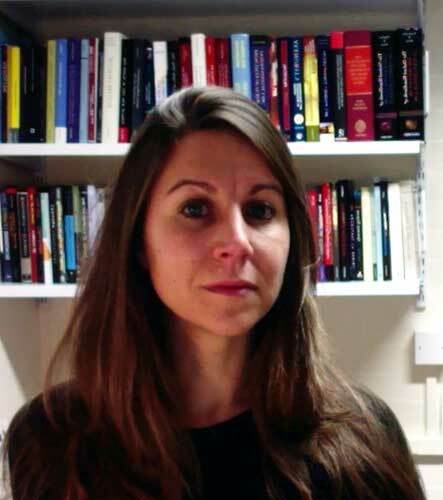 Her work has appeared in journals such as Law and Contemporary Problems; American Journal of International Law; Leiden Journal of International Law; Netherlands Yearbook of International Law; African Journal of Legal Studies; Journal of Law, Culture and the Humanities; and Studies in Law, Politics and Society, as well as in various edited collections. Her current book-length project explores the effects of International Criminal Court interventions based upon observations of the court’s work in Uganda, Kenya, and the Netherlands. Sara's undergraduate teaching responsibilities span across International Humanitarian Law, International Human Rights Law in Context and International Law. At Postgraduate her teaching spans Legal Aspects of Contemporary International Problems and International Criminal Law. Sara is interested in supervising dissertations in international law, legal theory and philosophy, international criminal law, international humanitarian law, global governance, critical and political theory, and colonial legacies in law. Kendall, S. and Nouwen, S. (2016). Speaking of Legacy Towards an Ethos of Modesty at the International Criminal Tribunal for Rwanda. American Journal of International Law [Online] 110:212-232. Available at: http://dx.doi.org/10.5305/amerjintelaw.110.2.0212. Kendall, S. (2016). Unsettling Redemption: The Ethics of Intrasubjectivity in 'The Act of Killing'. MediaTropes 6:22-44. Joshua Oppenheimer's documentary 'The Act of Killing' adopts a novel experimental approach to addressing mass atrocity. Perpetrators of Cold War era anti-communist purges in Indonesia are invited to narrate their acts through familiar film genres. The resulting narrative appears to fit within the ideology of transitional justice, with its emphasis on practices of healing, remorse and redemption. Yet the structural dimensions of violence remain unaddressed within this frame. The moral economy of affect and empathy displaces a political analysis of enduring power imbalances and ongoing injustice. Kendall, S. (2016). On Academic Production and the Politics of Inclusion. Leiden Journal of International Law [Online] 29:617-624. Available at: https://doi.org/10.1017/S0922156516000224. Kendall, S. (2015). "Constitutional Technicity": Displacing Politics Through Expert Knowledge. Journal of Law, Culture, and Humanities [Online] 11:363-377. Available at: http://dx.doi.org/10.1177/1743872113496518. In the decades following the end of the Cold War, the process of producing state constitutions has transformed into a veritable industry. This commentary considers contemporary practices of constitution-making as a site for critical reflection. It takes up the provision of “expert” advice in constitution-making processes in relation to three tropes of how these processes are conceived. As an attempt at diagnosing the constitution-making present, this commentary focuses on constitutional “technicity,” though aspects of what I term constitutional “romanticism” and “civility” continue to inform this technical turn. Kendall, S. (2015). Commodifying Global Justice: Economies of Accountability at the International Criminal Court. Journal of International Criminal Justice [Online] 13:113-134. Available at: http://dx.doi.org/10.1093/jicj/mqu079. The field of international criminal law operates on multiple overlapping registers, including the ideological, the economic and the political. As part of a symposium exploring the claim that international criminal law constitutes a form of ‘global justice’, this article takes up the relationship between the political interests and material conditions of possibility that inform and sustain the work of the International Criminal Court (ICC). As the field’s sole permanent institution, the ICC relies upon annual funding from its member states, producing a shareholder economy that draws upon managerial logics and reflects the interests of its constituency. This article considers the implications of regarding states as ‘shareholders’ of global justice, as well as the effects of the ICC’s ethos of austerity at the level of practice. It argues that international criminal law risks diminishing its value as a public good through turning to the logics of the private realm. Kendall, S. and Nouwen, S. (2014). Representational Practices at the International Criminal Court: the Gap Between Juridified and Abstract Victimhood. Law and Contemporary Problems 76:.-. Kendall, S. (2014). "UhuRuto" and Other Leviathans: the International Criminal Court and the Kenyan Political Order. African Journal of Legal Studies 7:.-. Kendall, S. (2011). Donor's Justice: Recasting International Criminal Accountability. Leiden Journal of International Law 24:.-. Kendall, S. (2010). Hybrid Justice at the Special Court for Sierra Leone. Studies in Law, Politics and Society 51:.-. Kendall, S. (2018). Immanent Enemies, Imminent Crimes: Targeted Killing as Humanitarian Sacrifice. in: Austin, S., Douglas, L. and Merrill Umphrey, M. eds. Criminals and Enemies. University of Massachusetts Press, pp. 130-155. Kendall, S. (2017). Cartographies of the Present: ‘Contingent Sovereignty’ and Territorial Integrity. in: Kuijer, M. and Werner, W. eds. Netherlands Yearbook of International Law 2016. Springer, pp. 83-105. Available at: https://doi.org/10.1007/978-94-6265-207-1_4. Kendall, S. (2016). Archiving Victimhood: Practices of Inscripton in International Criminal Law. in: Motha, S. and van Rijswijk, H. eds. Law, Memory, Violence: Uncovering the Counter-Archive. Routledge. Kendall, S. (2016). Beyond the ICC: State Responsibility for the Arms Trade in Africa. in: Africa and the ICC: Perceptions of Justice. Cambridge University Press. Kendall, S., De Vos, C. and Stahn, C. (2015). Introduction: Contested Justice. in: Contested Justice: the Politics and Practice of International Criminal Court Interventions. Cambridge: Cambridge University Press, pp. 1-20. Kendall, S. (2015). Beyond the restorative turn: the limits of legal humanitarianism. in: De Vos, C., Kendall, S. and Stahn, C. eds. Contested Justice: The Politics and Practice of International Criminal Court Interventions. Cambridge: Cambridge University Press, pp. 352-376. Available at: http://dx.doi.org/10.1017/CBO9781139924528. Kendall, S. (2014). Critical Orientations: A Critique of International Criminal Court Practice. in: Schwobel, C. ed. Critical Approaches to International Criminal Law. Routledge. Kendall, S. (2014). Marketing Accountability at the Special Court for Sierra Leone. in: Jalloh, C. ed. The Sierra Leone Special Court and its Legacy: The Impact for Africa and International Criminal Law. Cambridge University Press. Kendall, S. (2013). The Libyan Civil War and the Rise of the "Responsibility to Protect". in: Hwang, Y. -J. and Cerna, L. eds. Global Challenges: Peace and War. Brill. Kendall, S. and Sesay, A. (2011). "Seeing Justice Done": Outreach and Civil Society at the Special Court for Sierra Leone. in: Albrow, . and Seckinelgin, . eds. Global Civil Society 2011: Globality and the Absence of Justice. Palgrave Macmillan. De Vos, C., Kendall, S. and Stahn, C. eds. (2015). Contested Justice: The Politics and Practice of International Criminal Court Interventions. [Online]. Cambridge: Cambridge University Press. Available at: http://dx.doi.org/10.1017/CBO9781139924528. The International Criminal Court emerged in the early twenty-first century as an ambitious and permanent institution with a mandate to address mass atrocity crimes such as genocide and crimes against humanity. Although designed to exercise jurisdiction only in instances where states do not pursue these crimes themselves (and are unwilling or unable to do so), the Court's interventions, particularly in African states, have raised questions about the social value of its work and its political dimensions and effects. Bringing together scholars and practitioners who specialise on the ICC, this collection offers a diverse account of its interventions: from investigations to trials and from the Court's Hague-based centre to the networks of actors who sustain its activities. Exploring connections with transitional justice and international relations, and drawing upon critical insights from the interpretive social sciences, it offers a novel perspective on the ICC's work. This title is available via open access. Kendall, S. (2012). New Histories of the Present: Revisiting Post-World War II Juridical Forms. Melbourne Journal of International Law 13:349-357. Kendall, S. and De Vos, C. (2012). Foregrounding the 'Local': Place-based Approaches to Transnational Justice. The International Journal of Transitional Justice 6:.-. Kendall, S. (2008). Review of Antony Anghie, Imperialism Sovereignty, and the Making of International Law. Journal of Law, Culture, and Humanities 4:119-122. Kendall, S. et al. (2019). Cold War International Law. Cambridge University Press. Kendall, S. (2019). Inscribing the State: Constitution Drafting Manuals as Textual Technologies. Humanity journal. Kang, H.Y. and Kendall, S. eds. (2019). Special Issue on Legal Materiality. Law Text Culture 23. Kang, H. and Kendall, S. (2019). Introduction. Law Text Culture 23. Kendall, S. and Nouwen, S. (2019). International Criminal Justice and Humanitarianism. in: Oxford Handbook of International Criminal Law. Oxford University Press. Kang, H. and Kendall, S. (2019). Legal Materiality. in: del Mar, M., Meyler, B. and Stern, S. eds. Oxford Handbook for Law and Humanities. Oxford University Press.